So after being MIA since ever! I am back. I actually do get these fits, where I suddenly leave what I am doing and after a while I am back at it. But lots and lots happening with my YouTube channel Fat Toxic Bawarchi gaining momentum, you should definitely check it out for fun reviews and recipes. I started it with my two besties Mohit Chotrani aka Hungry Bawarchi and Roshan Shetty aka The Big Fat Shetty. Anyways I figured I will make a comeback with recipes. I am starting a segment of everything basic. But I want to start it with fillings, frosting and icings. I feel these things are most simplest but people are still scared or unaware of their simplicity. We all may have that perfect cake recipe but we strive for that perfect frosting recipe. So I am going to begin with the simple Vanilla Buttercream. Now this is a very basic Vanilla Buttercream recipe, aim is to make it tasty and make it tasty fast. Makes enough to pipe swirls on 10 cupcakes. In a large mixing bowl, add the sifted sugar and butter. Mix with a hand mixer/stand mixer on low speed till incorporated. Add vanilla extract and 2 tablespoon of milk. Mix on high for 3 – 4 minutes till it is perfectly creamed together. If the cream is too stiff, keep adding more milk little at a time till its soft but still holds peaks. In case you add more milk, you can always add more sifted sugar and balance it out. You can pipe them on cakes and cupcakes. Sprinkle some colorful sprinkles on top or some chocolate chips. Vanilla buttercream is the perfect cream to color, so if you want to go bright and colorful. You can add a few drops of gel color after adding the milk. So if you happen to try it. Please do comment and let me know. 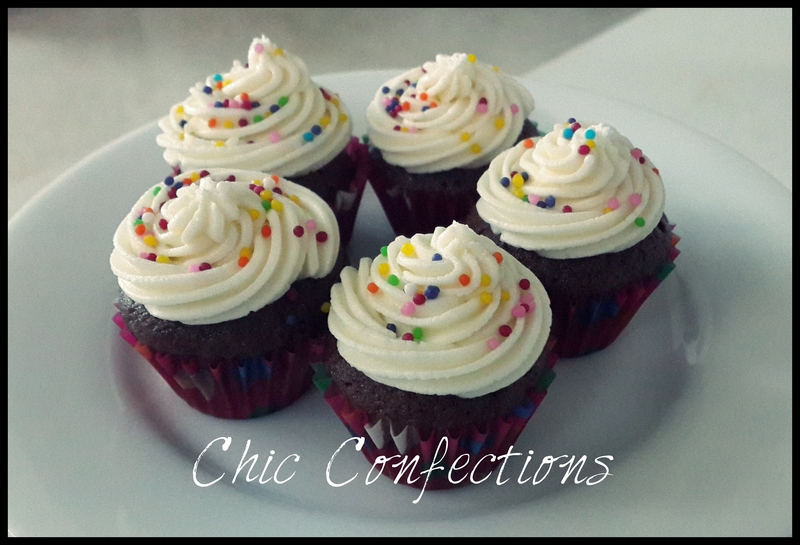 Till then wait for my Chocolate Buttercream Recipe.